Native white fringetree grown in shrub form. Fringetrees (Chionanthus spp.) are outstanding, small, deciduous ornamental trees. Two species are available, the native white fringetree (Chionanthus virginicus) and the Chinese fringetree (Chionanthus retusus.) The botanical name translates as snow flower, an excellent description of the fluffy, white flowers that cover fringetrees in bloom. White fringetree, also known as Grancy graybeard or old man’s beard, is native throughout South Carolina and the southeastern United States. Chinese fringetree is native to eastern Asia. Both species are adapted to all areas of South Carolina. Native white fringetrees remain small, maturing at 12 to 20 feet in height and 12 to 20 feet in width. Trees in the wild may be taller. Fringetrees naturally grow with multiple stems, but can be trained to single trunks. The typical form is spreading with an open crown, but plant habit can vary. Chinese fringetree is somewhat taller than white fringetree, usually growing 15 to 25 feet tall. The habit is similar to white fringetree, with a rounded, spreading crown, but is usually less open. Typical growth habit of Chinese fringetree. Fringetrees grow slowly, usually only 6 to 10 inches per year. 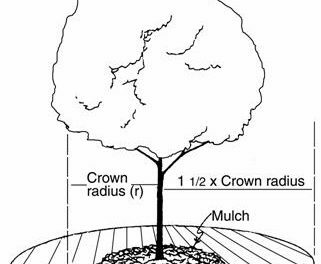 In ideal conditions with rich, moist, fertile soil they may grow up to one foot per year. There is only one growth period each year. Large, 4-to 8-inch-long loose clusters of lightly fragrant white flowers cover the white fringetree in spring for about two weeks just as the leaves begin to emerge. Flowers start opening in April in the Coastal Plains, and in early May in the Upstate. Fringe trees are dioecious – male and female flowers are on separate plants – although occasional trees may have both kinds of flowers present on the same plant. Male flowers are showier due to longer petals. However, both male and female trees are striking in bloom. Large, loose panicles of white fringetree flowers. Chinese fringetrees bloom at about the same time as the white fringetree, but their flowers are held in smaller clusters, 2 to 4 inches wide and long. Flowers of the Chinese fringetree have shorter, somewhat wider petals, and flower clusters are denser and held at the ends of the branches. Denser, but smaller cluster of Chinese fringetree flowers. The large, medium to dark green, oblong leaves of the native white fringetree are held oppositely on the stem. They range between 3 to 8 inches long. White fringetrees seldom have showy fall leaf color in the southeast, generally fading to yellow-green or greenish brown, but occasionally they will turn bright, clear yellow in fall. Chinese fringetree leaves are smaller than those of the native white fringetree, usually rounded, thick, leathery and glossy. While white fringetree flowers open before the leaves appear, Chinese fringetree flowers open after leaves emerge. Chinese fringetree fall leaf color is insignificant. Female fringetrees bear attractive fruit if male plants are nearby. The fruit are blue-black, ½ to ⅔ inch long and shaped like olives, to which fringetrees are related. The fruit ripens in late summer to early autumn and are enjoyed by birds. When fruit are still present during years of good fall leaf color, the contrast of dark blue fruit and yellow foliage is striking. Due to a naturally strong branch structure fringetrees rarely need pruning. Pruning while young may be desirable if a single stem tree form is preferred. As fringetrees do not transplant well, take care to choose an appropriate permanent location and use proper planting methods. 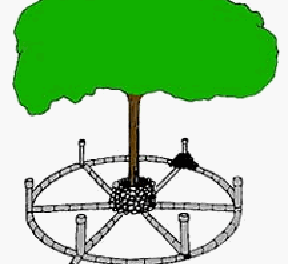 Propagation of fringetrees is usually by seed. Seeds are planted in fall with young trees sprouting the second spring after planting. Propagating native white fringetrees by cuttings has not been successful. Some trees are grafted onto ash understocks. If this is the case, sprouts from the understock must be watched for and removed promptly. Insect pests and diseases are rarely serious problems for fringetrees. Scale can be controlled with horticultural oil sprays. Mites are pests in full sun locations. A borer is the most serious insect pest. Borers are more likely to attack trees that are already stressed or have wounds. Phytophthora root rot can occur on plants in soil with poor drainage. Botryosphaeria dieback may occur on plants that are stressed, particularly by drought. Powdery mildew and leaf spots can occasionally be problems.